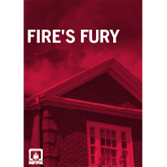 Motivate people to get serious about fire safety by unleashing Fire's Fury! Most people underestimate the speed and power of fire and smoke. As a result, they don't know the real danger and get complacent about fire safety. After watching NFPA®'s Fire's Fury! Video, audiences are sure to take fire safety more seriously and adopt life-saving behaviors to protect themselves and their family. Bring viewers face-to-face with the devastating reality of a home fire! Presented in docudrama style, Fire's Fury! is a personal account of one family's close call with a fire. Interviews with family members while they move into their new house reveal details of the frightening experience that starts when the teenage daughter leaves a candle burning in her bedroom. As the story unfolds, a dramatic onscreen fire recreation provides an eye-opening look at how rapidly smoke and flames can spread, reaching life-threatening proportions in just seconds. Show the larger impact on the community and how fire departments and schools contribute to fire safety.